Z003 Paramecium caudatum showing Conjugation, W.M. Z004 Paramecium caudatum showing Fission, W.M. 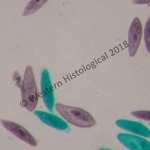 Z025 Giardia lamblia, trophozoits, W.M.